Today I had the privilege of teaching 42 little six year old children about money. They were SO cute, I could eat them up. 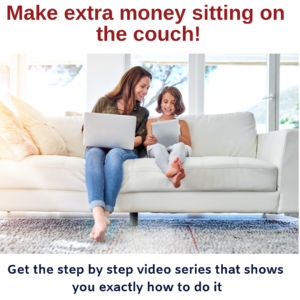 The most important thing is that the way you teach them about money changes as they develop. Their brains are changing, and their understanding of value is changing. Their level of maths skills is also an important factor. When they are young, their learning style and preferred thinking style is concrete. They like to do things physically. Physically receive the money, physically split the money between what they want to spend and what they want to save. Little people get more benefit from physically dealing money than they do from the concept of a bank account. ‘Cos mumma, where did the money go to? What age should you start? Any age is fine, so long as it’s age appropriate. I personally start my girls in Grade 1. Each week, our eldest daughter gets R20 pocket money. We divide it in four: R5 goes to Give, R5 to Save and R5 to spend. Then she gets to choose what she does with the last R5. She can put it in any jar (no judgement). And then we incentivise saving by giving her an extra R1 for every R10 she saves in the Save Jar (only). I know, 10% per month is a huge interest rate. But she learns that she gets ‘Free Money’ when she saves. And that free money is the first Rand towards the next R10 for free money, so now she only needs to save R9 and not R10 to get her free money. Interest after all is “free money”. And compound interest is earning “free money on free money”. So we start to teach them that saving is good because you can earn free money on free money. 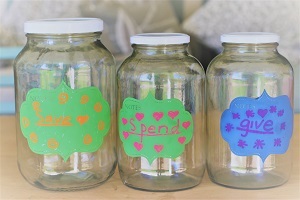 I don’t do it for the other two jars (spend and give) because I’m incentivising saving. For ‘Give’ money, the girls must keep one coin for church on Sunday. Other than that, they are welcome to give it to whatever cause they want. A person begging, buying something from a street vendor. Whatever is your family’s giving philosophy, use their money to teach it to your children. Before they can add – Just get them used to physically dividing their money between give, spend and save. And physically seeing you put free money in to the save jar as together you count how many tens they have. When they can add and subtract – Buy them a book and divide it into four tabs with a tab for each of Give, Save, Spend and Free Money. And then practice their maths with them that each time they get a deposit, they write it in. There should be 4 columns – the first for the date; the second for the description of the source of income (gift, pocket money, interest); the third for the amount deposited or withdrawn; and the last for the running total. Every time they take money out to spend, they write down what they spent it on as e.g. a R-20. And if there’s change, that comes back in as a deposit. Record for each jar separately, but do two entry’s for your interest payment in SAVE. When they can divide and multiply – then you start Shopping Maths! So that each time you’re in the shops, you work out whether it’s cheaper to buy the big bulk version, or the smaller one. You’ll be amazed how often it actually isn’t cheaper to ‘buy in bulk’. Start to reduce the interest you give down to R1 for every R20 in preparation for the bank account. You may now be able to start bank accounts, depending on your child. Keep the Spend and Give jars, but move the save jar to a bank account. When they can do percentages – this is when they can definitely do bank accounts and should have one by now. And it’s when the bank starts paying the interest (phew!). Still keep tracking interest payment, but now there’s an additional calculation one does with them – earning interest on interest. 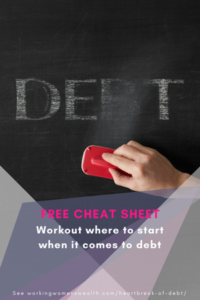 They work out how much of the interest comes from the money they save, and how much comes from the interest they are earning on interest. It teaches them the power of compounding that comes with time. There is NO guarantee that by teaching children about money in this way that we will get a generation of savers. But my view is that if we start them early on the fact that there’s more than one option other than spending, that that would be a start. If we can then teach them why you invest – to earn free money on free money – we may make a small impact on a retirement saving culture. Regardless, as parents, we all want to know that we have at least TRIED to build a foundation for one of the important elements of life. Money.